Faheemah Salahud-Din lives to serve and empower the black community in Bakersfield with the hopes that one day her children — and every person of color — can live in a world where everyone is treated with respect and love. “My children have to live in better world than I live in and their kids have to live in a better world than what we currently live in,” said Salahud-Din while explaining her drive to work for a better community. 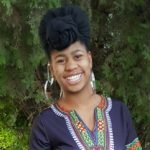 Salahud-Din started a clothing business that empowers women of color; works for a local non-profit that educates, unites and preserves the culture of indigenous “Afrikan” origin; and encourages people to lift up their voices through writing. She began working in 2015 with First and Always Melanin (FAAM), a local nonprofit created by the VP Clifford Cole. FAAM’s mission is to unite people of indigenous “Afrikan” origin and preserve the life of black people in Bakersfield through “activism, holistic health, knowledge of self, unity, cooperative sustainable economics, education and by implementing programs that improve the community’s quality of life,” says the organization’s Facebook page. Salahud-Din, the executive director of FAAM, has done outreach work with the organization. Her first event with FAAM was a screening of “Hidden Figures” in 2015. After attending the Million Man March in 2015, she wanted FAAM to help create social change. As a result, FAAM hosted Black Winter, an open mic event for black artist to showcase their talent. The cost of entry was one gently used coat or five pairs of brand new socks. That’s when Salahud-Din saw FAAM’s potential. The organization began working with other groups, such as The Dolores Huerta Foundation and Faith in Kern. While working with FAAM, Salahud-Din also started her own clothing line, Glitter and Goon, which is geared toward creating social change and empowering women. “There is a need for clothing that empowers women of color — specifically black women — and to take it a step further, there is a need for clothing that empowers all women,” Salahud-Din said. When she launched Glitter and Goon in 2017, most of her customers were outside of Bakersfield. People in Hawaii and Trinidad began buying her clothes. It wasn’t until 2018 when the local community began purchasing her clothing. Salahud-Din doesn’t just express herself and advocate through her clothing line and nonprofit. She also expresses herself through her words. She has been writing since she was 12 years old and wrote her first book when she was just 14. “I didn’t do anything with it, and I really regret that because I allowed fear of rejection and fear of validation to hold me back from doing something I know I was called to do,” Salahud-Din said. In 2018, she released her own poetry book, “Ascension,” inspired by a break up. “It freed me, and it gave a voice to my experience, and it gave the women who had my experience permission to feel comfortable in their truth and I’m very honored that I was able to do that for us,” said Salahud-Din. Now, Salahud-Din is providing a platform for others to be heard. On March 30, she is hosting her second Goddess Cypher, a place for women to come and heal through the arts. There will be several black women speaking on panels. The event kicks off at 5:30 p.m. at Cal State Bakersfield. Tickets are available on eventbrite.com for $30. The event starts at 5:30 p.m.
Editor’s Note: To celebrate Black History Month, South Kern Sol is highlighting notable leaders in Kern County who are working to create positive change in their community. Do you know somebody who deserves to have their story told? Contact us at Elizabeth@SouthKernSol.org.